I know that I just got done with the chocolate cake challenge, but I wanted to make a chocolate cake for an early Valentine’s Day treat for my mom. Mike and I usually go to visit her on Sunday night’s to visit and play cards. Some of my siblings usually stop in also and we have a great time together. So I wanted to have something special for everybody to enjoy. And how can you celebrate Valentine’s Day and not have a little chocolate. My cake was a big success, everybody enjoyed it. By the time that everyone had a piece there wasn’t much left. I did leave an extra piece for my mom to enjoy for the next day. I love being able to surprise her with something she enjoys, she has done so much for my siblings and me. I feel it is my time to give back to her. 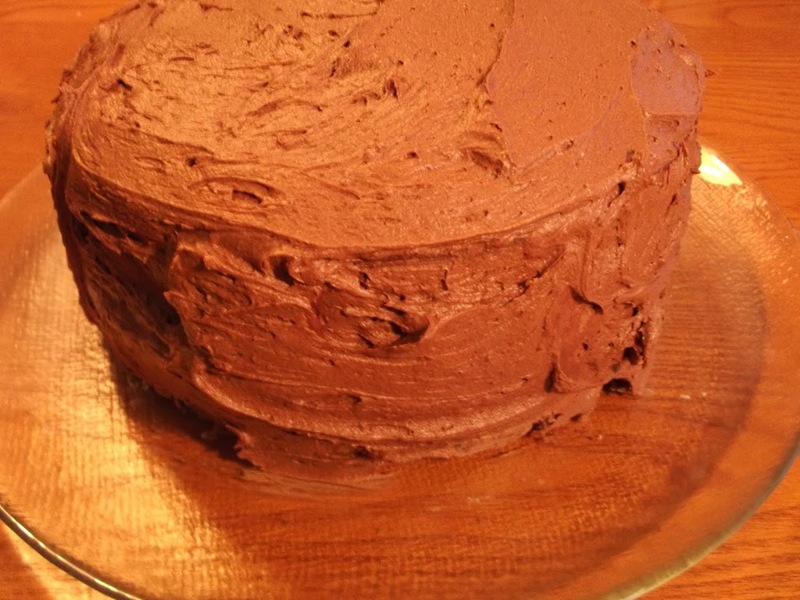 This cake was a luscious chocolaty cake, with a very chocolaty frosting. 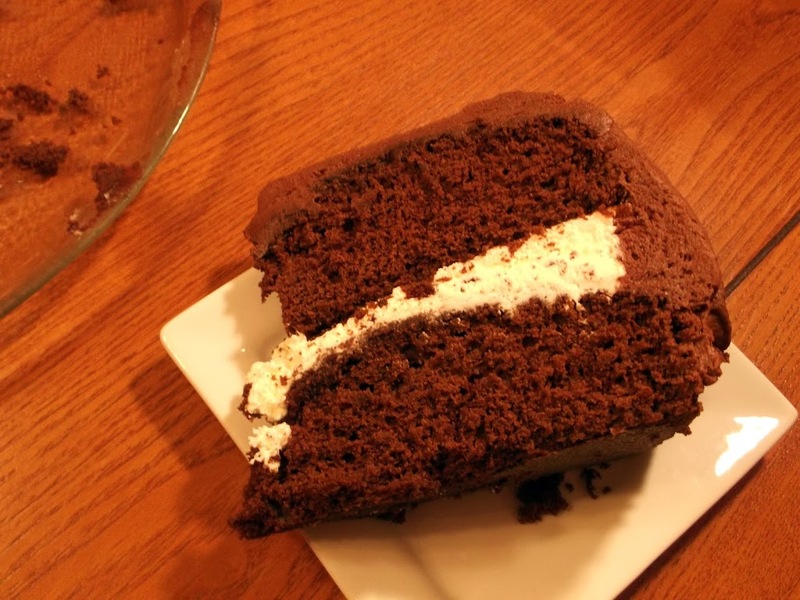 I used the whipped cream filling that I used in the cake challenge, but with a little twist, I added a few drops of mint extract to give it a minty flavor. We loved the chocolate and mint; it is such a great combination. 3 to 4 tablespoons heavy cream (This was not enough cream the frosting was very dry, I used about 1/2 cup). 1. Preheat the oven to 350 degrees F. Lightly grease and flour two 8 inch round cake pans. 2. In a small bowl, mix the cocoa and boiling water until blended and smooth. 3. In a large bowl, beat the butter and sugar with an electric mixer on medium speed until smooth and creamy, about 2 minutes. Beat in the eggs on at a time and beating well after each addition. Beat in the vanilla and salt. 4. Stir the baking soda into the buttermilk. Alternately add the butter milk and flour to the batter, beating well after each addition until all is blended. Beat in the cocoa mixture until blended. Increase the mixer speed to high and beat for 3 minutes. Divide the batter between the prepared pans and spread evenly. 5. Bake until the cakes pulls away from the sides of the pans and a toothpick inserted into center comes out clean, 30 to 35 minutes. Set the pans on a wire rack to cool for 10 minutes. Take cakes out of pans and cool to room temperature. 6. Make filling: Beat cream with sugar add mint extract and put in refrigerate to chill. 7. Make frosting: In a large bowl, whisk together the sugar and cocoa until blended. In a medium bowl, sing and electric mixer, beat the butter until smooth. Add the 1 cup of the cocoa mixture and 1 tablespoon of the cream until blended. Repeat adding the cocoa mixture and cream until all is combined, and frosting is smooth and fluffy. Beat in vanilla and additional cream if necessary for desired consistency. 7. Assemble the cake and enjoy!! Delicious, I can see why the cake didn’t last very long! 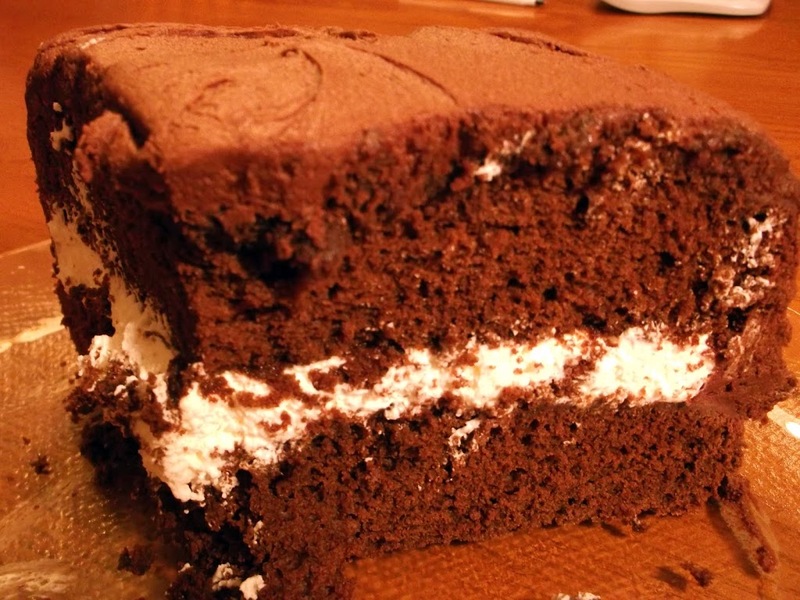 Yum – this cake looks so moist and yummy!